The SCAA's education program is an important part of our mandate. Workshop topics have included copyright, arrangement and description of archival holdings, digitization for archives, managing audio-visual records, the preservation of historic photographs, the preservation of optical and magnetic media (modern information carriers), and public awareness for archives. See our list of previous workshops below. 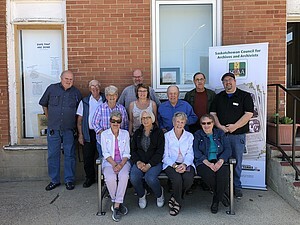 This SCAA will host the Canadian Conservation Institute (CCI) with their "Digital Preservation Workshop" on Wednesday, April 10 2019 at the Moose Jaw Public Library. This workshop outlines best practices for preserving digital information. Topics covered include appropriate selection criteria for physical carriers as well as tools for taking stock of existing digital assets and for developing digital preservation policies, plans and procedures. Software and hardware solutions for digital preservation in small to medium-sized heritage institutions are also recommended. install and use hardware and software for the purpose of preserving digital assets in smaller heritage institutions. Museums Association of Saskatchewan (MAS) members are eligible to register at SCAA member rates for this workshop only. As the SCAA has seen many new institutions applying to the IGP, has offered a FREE grant writing webinar to help members understand and complete the 2019-20 IGP application form. On January 26 the SCAA was pleased to offer a one-day workshop in Humboldt for free that introduced participants to the basic archival functions of digitization of archival material, its preservation and storage. Discussion will also touch on the acquisition of “born-digital” items by Archival Institutions as well as reasons for digitizing material. July 23 in Craik at the Craik Oral History Museum. The SCAA is asking if there is any interest in future "Basic Archives" workshops. Dates and locations will be determined by the level of interest. On March 12th, 2018, the SCAA hosted a day-long workshop on the topic of Indigenous-Settler relationships, decolonization, and reconciliation, called the Respect and Relationship Session. The workshop consisted of a morning talk by Eugene Arcand, a Residential School survivor, about his experiences. After lunch, participants were invited to join in a blanket exercise, a teaching tool to share the historic and contemporary relationship between Indigenous and non-Indigenous peoples in Canada. The following is a brief review of the event, with reflections on the morning's talk by Crista Bradley of the University of Regina, and reflections on the blanket exercise in the afternoon by the Provincial Archives' Jeremy Mohr. On the morning of March 12, 2018, SCAA members gathered for the first half of the Respect and Relationship Session. We heard Eugene Arcand, a Cree man from Muskeg Lake First Nation, speak about the experience and effects of the eleven years that he spent in Saskatchewan Residential Schools. He also spoke about the Residential School Settlement Agreement and reconciliation at both personal and national levels. Eugene was so articulate and compelling. He shared thoughtful and candid reflections on being taken from his family, his time at school, and some of his challenges and accomplishments in the years that followed. He showed us a well-loved archival photo of his fellow classmates, and referenced it throughout the morning - adding names and stories to some of the others who walked part of this road with him. It was so generous of Eugene to share some of his history with us, to help those of us assembled understand a little more of our own. What are some potential outcomes for archivists (and by extension, archives) from better acquainting ourselves with Indigenous histories and experiences? How might this knowledge affect the ways in which an archive connects with its community? Would you like the SCAA to host more workshops like this one? Why or why not? What parts of your own collections highlight the histories of marginalized segments of the population? How might you bring these histories to light? What are some of the challenges you have faced in working with materials related to Indigenous histories? Through SaskCulture and the Saskatchewan Lotteries Trust Fund for Sport, Culture, and Recreation, the SCAA is able to offer financial support for members' travel to Council-sponsored workshops as well as other professional development opportunities. The guidelines and application form are available for download below. Completed applications should be sent to the SCAA office.